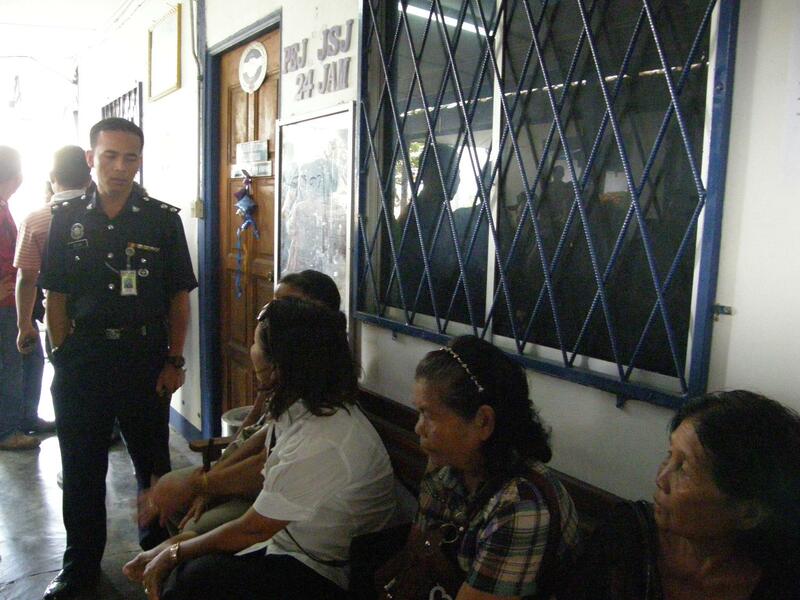 A late night police raid on August 12 in Serian, Sarawak, against Iban villagers fighting oil palm companies over Native Customary Rights (NCR) to land, led to no charges being brought, let alone convictions. But the arrests produced a comical standoff at the Serian police station, when five arrested Iban villagers were released on August 15. The announcement by Housing Minister Datuk Amar Abang Johari Openg on Monday that two longhouses will be issues with strata titles this year has aroused Sarawak PKR chief Baru Bian’s curiosity since he has had a long standing interest in matters concerning NCR land and the issuance of titles for such land. If the government continues to remain aloof from clashes between natives and oil palm companies, then it should be prepared for a bloodbath. Despite two attempts on his life by workers allegedly from Palm Raya Pelita, Semawi Anak Renang will not be intimidated in defending his native customary rights (NCR) land and that of 25 other families. Instead the threats against him and the other landowners of Rumah Randi, Selangau, have made them more determined than ever to defend their 3,000 hectares of land. Angry land-grab victims of the Rungus, Kimaragang, Sonsogon and Sungei tribes in northern Sabah have pledged to defend their NCR lands to the death. More than 300 angry natives in the northern parts of Sabah staged a peaceful but powerful rally protesting against the prevalent land grabs in Kudat, Pitas, Kota Marudu and parts of Beluran. 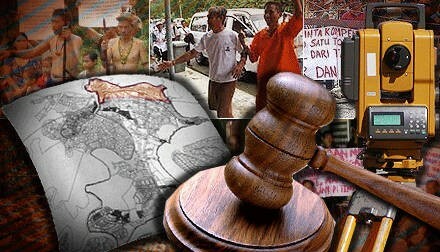 They claimed the land grabs, some of which they alleged were backed by politicians from the ruling party, had resulted in bitter experiences for thousands of them. The Sarawak Forestry Department issued logging licences to BN cronies for land earmarked for resettlement of natives affected by the construction of the Bengoh Dam. KUCHING: Two timber licences issued by the State Forestry Department have put a spoke in the state’s scheduled timeline to complete Bengoh Dam. The licences were issued to leaders in Taib Mahmud-led Parti Pesaka Bumiputra Bersatu (PBB) and to the cronies of Sarawak Progressive Democratic Party (SPDP) president William Mawan Ikom. The High Court here has granted an interim injunction to restrain a timber company from encroaching into native customary rights (NCR) land claimed by long house residents in the Bintulu Division. Judge Datuk Rhodzariah Bujang granted the injunction after an ex-parte hearing in chambers following an application submitted by counsel for the long house residents See Chee How, last Friday afternoon. 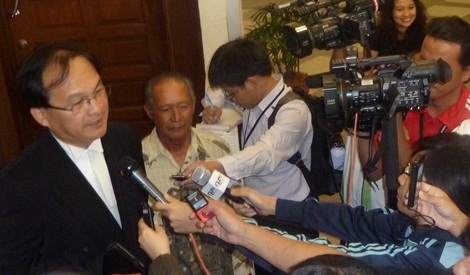 The full hearing of the application is scheduled to be held at the Bintulu High Court on Jan 30. 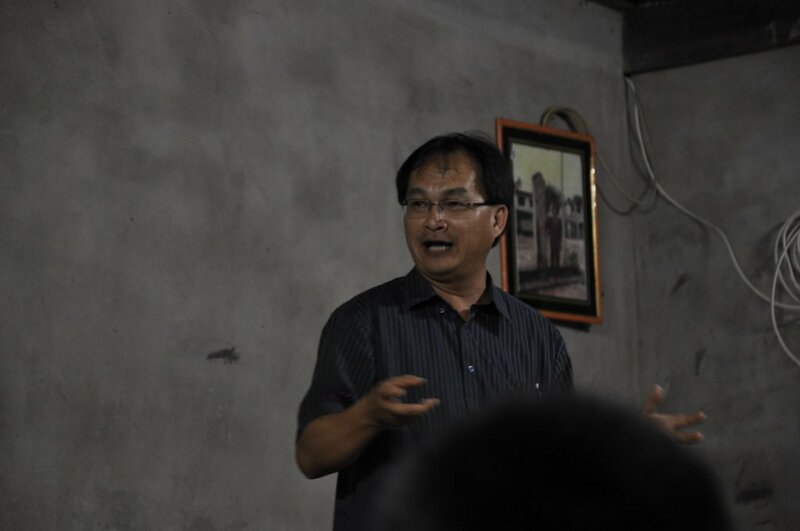 Village headman Nyipa anak Tingang of Kuala Pandan, Sebauh in Bintulu, representing himself and 63 other residents, claimed that they are the proprietors, occupiers, holders and claimants of the land surrounding Ulu Sungai Kakus and Ulu Sungai Merirai. Angry Iban landowners from Balai Ringin are demanding that Land and Survey Department director Sazali Kipli withdraw the provisional leases (PLs) on native customary rights (NCR) land. The PLs on these lands have been awarded to a number of private companies. Some 50 landowners expressed their dissatisfaction to Sazali recently and demanded that the government withdrwa the PLs or face the consequences. “We are giving the department 30 days starting from Jan 17 to withdraw the PLs, failing which we will come again to express our displeasure. All four joint-venture projects with Sarawak native landowners have failed . About 500 native landowners have accused Chief Minister Taib Mahmud of cheating them. The landowners had taken part in four of Pelita (Land Custody Development Authority) joint-venture companies modelled on a new native customary right (NCR) land development concept which was conceived by Taib. 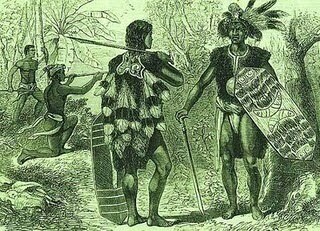 The landowners claimed that they were cheated by the companies of their dividends. The Freedom Film Fest received an enthusiasic welcome when it came to Kuching and Miri during the last weekend of October. This is the fourth year this excellent film festival has come to Sarawak, showing challenging films about human rights, politics and democracy, sexuality, religion, indigenous people’s issues and society – far more intriguing films than the standard commercial drivel in our cineplexes. The five films screened were free, in more sense than one. The festival was open to all Sarawakians, and all were welcome, with only a collection box going around. Owners of native customary rights (NCR) land who joined the Sarawak’s Felda-styled schemes are crying foul. Native landowners in Bau district who joined the government-linked Sarawak Land Custody and Rehabilitation Authority (Salcra) scheme hoping for financial success may now have to declare themselves bankrupt. According to Sarawak PKR, the poorly managed Salcra schemes have not only deprived the landowners of an income but has plunged them further into debts. We, the residents of Kampung Wawasan, Suai, Niah, Miri Division, Sarawak wish to appeal to the Sarawak State Government to urgently take the necessary action to exclude all the land which we have occupied and cultivated from the provisional lease issued to the company, Mega Jutamas Sdn. 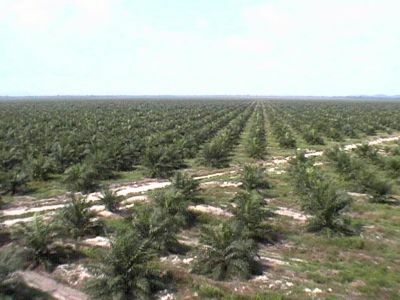 Bhd., over the area known as Lot 95 Sawai Land District for the establishment of an oil palm plantation thereon. The said company, Mega Jutamas Sdn. Bhd. is owned by a few shareholders who are already “multi-millionaires” and who also owned other companies which have already been given thousands of hectares of State land by the Sarawak Government for loggings and oil palm plantations in various places in Sarawak including in Niah and Suai areas. For these few individual “multi-millionaires” they only need the land in Lot 95 to make additional business and profits. The camerawork was admittedly shaky, but a short documentary called ‘Ulu Bengoh Darom Piin‘ (or ‘Upper Bengoh, underwater’ in one of the Bidayuh languages) that premiered at the Freedom Film Fest on Oct 2, was quite an eye-opener. Joachim Leong, fresh from law school, recently led a team of young urban film-makers to four rural Bidayuh villages up in the mountains of Bengoh, Sarawak, 45 minutes’ drive from the cineplexes and Starbuckses of Kuching. Land Development Minister James Masing wants native landowners to continue supporting companies that failed to pay them dividends for the last nine years. A Sarawak opposition leader has slammed the state Land Development Minister James Masing for his callous call to landowners not to renege on their agreement with Boustead Holding and Land Development Custody Authority or Pelita. PKR vice chairman See Chee How said Masing lacked understanding of the problems faced by the landowners in Kanowit. Today, another judgment handed down by the High Court in Sabah and Sarawak at Sibu, is another clear proof that the land grab by the present State Government of Native Customary Land (NCL) in Sarawak is on the rise. The proposed Baram Dam is to be placed on hold following strong opposition from the Orang Ulu natives of Kayan, Kenyah and Penan communities – about 20,000 of whom face displacement as a result of the project. 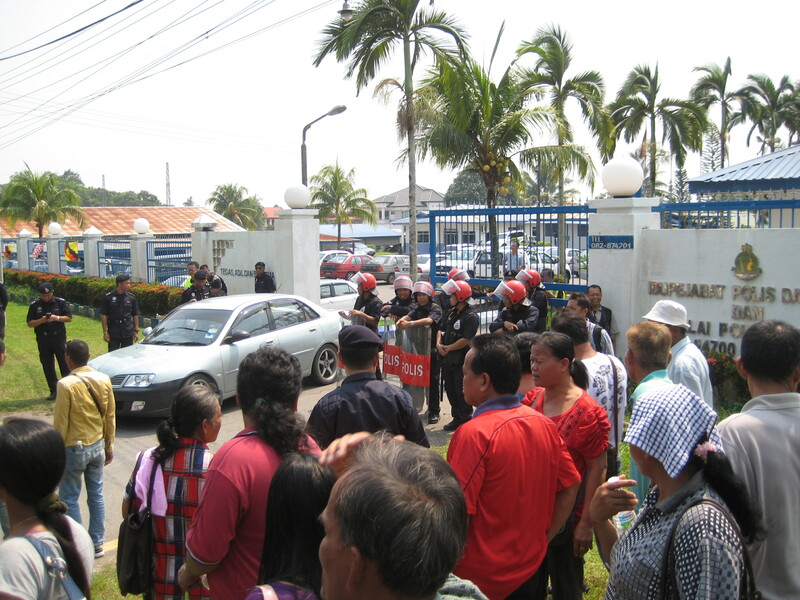 Despite the disappointing outcome at the Federal Court, Sarawakian natives involved in the case vowed to pursue for proper compensation of their law native customary rights (NCR) land through more lawsuits. Aging Bato, son of one of the five plaintiff Baleh Naha Jalei longhouse chief Bato Bagi, said his father had asked followers to pursue the matter until it was resolved. Bato is a instrumental figure in the important suit – dubbed the Bagi Bato case – which will have a impact on more than 100 similar cases that are pending. Bato, 78, died of leukemia two months ago. “My father wanted us to strive hard over this issue. He wanted justice for the villagers in the longhouse,” he said, describing his father’s last words. The Federal Court today refused to answer a question on whether the seizure of land by the Sarawak government for the Bakun dam was unconstitutional or not. The decision by Chief Justice Zaki Azmi (below left) and the Chief Judge of Sabah and Sarawak Richard Malanjum, both of whom refused to answer the question, was to let other pending cases deal with the issue. The other Federal Court judge, Justice Md Raus Sharif, answered the question in the negative, and said the seizure was not unconstitutional. The Federal Court is to deliver a key decision this afternoon on whether the seizure of native land owned by five longhouse residents to make way for the Bakun dam project 14 years ago is constitutional. A lot is riding on this case – referred to as the Bato Bagi case – as it will set the precedent for other native customary rights land claims in Sarawak. There over 100 pending claims by natives in the state. This will also be the last judgment delivered by Chief Justice Zaki Azmi, who will step down on Monday after reaching the retirement age of 66. Local village headmen are being told that the government has shelved the construction of the Baram Dam. The deceitful and insidious manner by which the state government is going about with the construction of the Baram Dam has angered the Orang Ulu communities in the dam project vicinity. Orang Ulu National Association Miri (OUNA) chairman Pete Kallang said: “As one of those affected I just can’t understand this injustice and this outrageous and abusive exploitation. “Why, it could be seen as an act in complete disregard for our well-being and opinion. Section 6 of the Sarawak Land Code under which surveyed NCR lands are being classified has brought the government’s ‘real intention’ to light. The Sarawak government, which is already under heavy fire over its land policies, has been accused of “hoodwinking” poor, ignorant natives with the perimeter survey procedure which aims to demarcate native customary rights (NCR) property. State opposition PKR has accused the Sarawak government of “abusing and misusing” the office of the state Attorney-General’s Chambers (A-G) to defend the wrong-doings of a few who continue grabbing native customary rights (NCR) land. Martin Ak Lindang, Biju Ak Nyelang and Buang Ak Jala have added their names to the list of proud native plaintiffs in Sarawak who have successfully defended the native customary rights land, for themselves and on behalf of the other 500 village folks dwelling in the 2 longhouse communities of Rumah Musih and Rumah Usek, in Kampung Sg Merak, Pantu, Simanggang. Sarawak Chief Minister Abdul Taib Mahmud has responded to humiliating setbacks in Native Customary Rights (NCR) lawsuits by forcing through a motion in the state assembly to change the definition of ‘native’. Yesterday, the first sitting of the state legislature passed the Land Custody and Development Authority (Amendment) Bill 2011, despite resistance from Pakatan Rakyat members, in order to lubricate joint-venture deals to take over NCR land. Villagers in Lundu are claiming that a company has ‘contravened laws governing NCR’ by harvesting timber from their land. KUCHING: Bidayuh landowners from four villages in the Lundu district – Kampung Stum Muda, Kampung Stungkor Baru, Kampung Stungkor Lama and Kampung . Bokiah – have claimed that a Miri-based timber company has cheated them through an ‘undated, unsealed and improperly attested agreement’.